When you think of a glazed ham, you normally think it should be reserved for a huge holiday meal or special occasion. Am I right? Well, nothing could be further from the truth. I know I've said this before, but it's worth repeating: My Mom used to say that ham is always great to have on hand because you can have it at any meal. 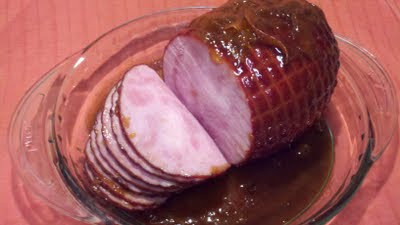 Ham and eggs for breakfast, ham sandwiches for lunch, add a few veggies and a starch and you have a yummy ham dinner. So, yes, this is perfect for a holiday dinner or for a party, but you definitely don't have to wait until then! Make this on a Monday night and you'll be set for several meals during the week! Place the ham in a shallow baking dish, (remove the net casing, if it has one). Cover tightly with foil. Place in oven and let it roast for 15 minutes per pound. Meanwhile, combine remaining ingredients. Remove the foil for the last 15 minutes of cooking time, then slather the glaze over the ham. Let it finish cooking, uncovered. Let it stand for 15 minutes after removing it from the oven. If orange is not your favorite thing, try using a different kind of fruit preserves or jelly instead of the marmalade. Apple, pineapple, apricot, peach, or even strawberry or raspberry would be absolutely delish! If cloves are not your favorite thing, simply omit them! It'll still be yummy!